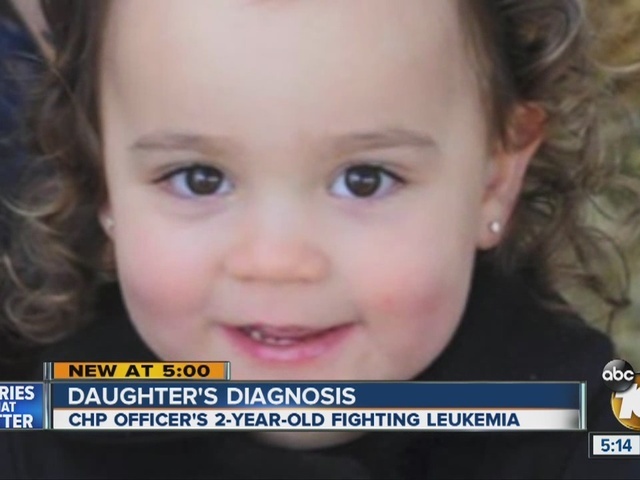 A local California Highway Patrol officer and his wife just received the worst news of their lives -- their two-year-old daughter has been diagnosed with leukemia. CHP Officer Jared Mikulsky and his wife, a nurse, make their living helping others, but now the couple find themselves in need of help after learning of Kaylee's diagnosis. Mikulsky was one of the CHP officers involved in the 2014 rescue of four children whose father led authorities on a pursuit and standoff after being accused of killing their mother. After the father's arrest on a Santee overpass, Mikulsky and fellow CHP Officer Jiri Rutner were photographed taking two of the four children to safety. It was an iconic image from a tragic story. Officer Mikulsky (left) and Officer Rutner with two of the children following the standoff. Kaylee is at Rady Children's Hospital undergoing treatment, including chemotherapy. Her family has set a GoFundMe page to help pay for what insurance won't cover.